All Heating Control Thermostat models are available for purchase in our on-line store and ship factory direct (Brookfield, WI U.S.A.) via UPS Ground to commercial, school, and residential addresses in USA. For international orders please call 602-621-0332 or email us (click here) for a shipping quote. Pro-Grow heavy duty steel enclosed capillary tube design with baked enamel finish to withstand the greenhouse environment. Capillary length is 30 in. with sensing bulb allowing for remote sensing. 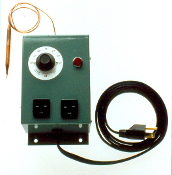 Thermostat control range 40-100 degrees F, with dial adjustment and pilot light. Designed to control soil temperature to within 1 degree F of thermostat setting to insure optimum seed germination and uniform plant growth. Has 2 GFCI grounding receptacles for use with heating mats, heating cables, or other devices. Cord 6 ft. with grounding plug. 120V-1500W-12.5A res. 1/6HP IND. / est. shipping wt. 4 LBS. Made in USA. Designed for use with up to 2 Pro-Grow Heavy-Duty Propagating Mats (works excellent with all mat models - sold separately). *NOTE: The sensing bulb at the end of the capillary tube MUST be located in the soil that you are controlling. The sensing bulb MUST be inserted at least 1/2 of it's length in the soil. Consider our proven heavy-duty steel enclosed thermostats for durability and longevity. Enjoy increased production year-after-year with Pro-GrowTM, a trusted brand in manufacturing heavy-duty horticulture products in the U.S.A. for over 30 years.